Feat of the People website. May be that's where I'm going wrong, I was using Western characters not Cyrillic? I've been trying to use this website but everyone I enter comes back not found, even people I know are listed: http://www.podvig-naroda.ru/ Anyone know where I'm going wrong? 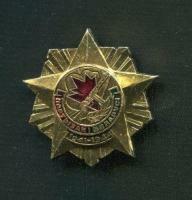 Bulgarian Anti-Fascist Medal - can anyone translate please? Hello, This is the award document for my latest acquisition, the Bulgarian Anti-Fascist Medal. Can some kind person please translate what's been written? I work with a lot nationalities, but as yet unfortunately no Bulgarians. Regards Duncan. Thanks for the info. Could see nothing about it on the Internet. Anyone know anything about this Greek resistance medal. Is it official or just a fantasy piece or tourist souvenir? Regards Duncan. I wondered why I couldn't log on to it! Just found out the possible reason on Radio 4 - Ebay and PayPal have been deleting sellers from outside the UK who haven't been charging 20% Vat on what they sell. Just noticed another Indian seller I use that's disappeared. Ebay even removed the positive feedback he'd left me! Can't seem to find it at all on the Internet. 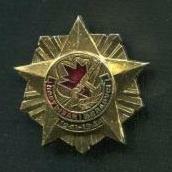 Seller says it's Ukrainian partisan related. Cheers Duncan. Hi, thanks for the reply. It seems like a lot of them have fallen off lately, and a search on Ebay hasn't shown any more. Plenty of Pakistan dealers but very few India. I was wondering if they'd brought in some law banning the sale of medals or something? Regards Duncan. I used to have quite a list of Indian sellers on Ebay selling Indian medals, but they've all one by one disappeared. And a search hasn't revealed any more. Not sure why! Anyone know of any Indian dealers selling on Ebay or on the Internet? Hello, thank you for the information. Kind regards, Duncan. I believe its Yugoslavian but can't find anything about it on the Internet.